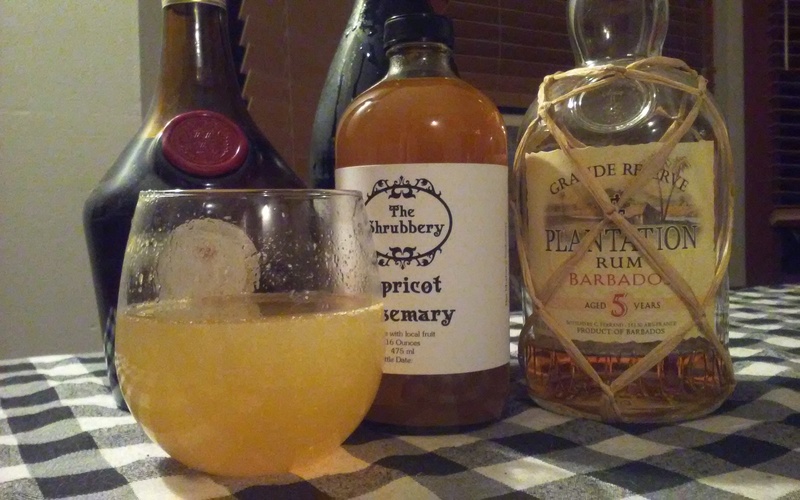 This month’s Mixology Monday theme is Orange Juice, from Spirited Remix, which isn’t an ingredient I tend to work with. But it’s been a while since I participated, and I do love a challenge so experiments needed to happen. To start, I had to pick a shrub (because that’s my theme) that would match with orange juice. Thankfully, I’ve been producing an Apricot Rosemary shrub and apricots and oranges are lovely together. Many of my customers ask me about mixing shrubs with champagne, so I wanted to incorporate something with bubbly. In this case Proseco, but I think I’ll make this again with Cava to see how it changes. Because science! Then, of course, we had to pick a base spirit. I’ve made a lovely cocktail with our Apricot shrub, a resposado tequila and Cointreau. But we were out of resposado, and silver tequila plus mezcal just wasn’t working for me. 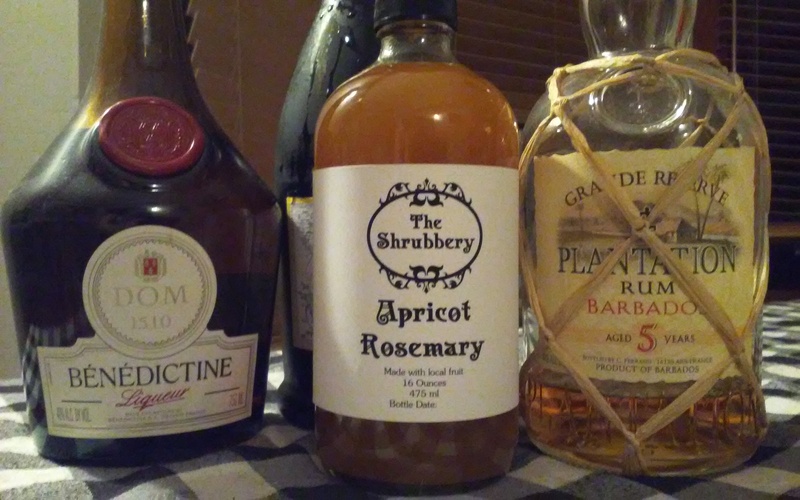 We tried a light rum with an herbal honey liqueur but the end result essentially tasted like a mimosa. And that’s not what I was after. Then, my head of R&D (D for drinking) suggested Benedictine and a richer rum. I settled on Plantation’s 5 year. I love aged Barbados rums, and this is a lovely example with a nice amount of vanilla and brown sugar while staying light (Mount Gay Black Barrel would likely also be a nice choice here, but give more robust barrel and brown sugar notes). This was a lovely combination, that has a touch of tiki and a bit of herbaceousness. For my sparkle, I went with Proseco which added sweetness to the drink that was pleasant but not cloying. If you prefer a dryer cocktail, use Cava. In a shaker with ice, combine all but the bubbly. Shake until well chilled, 10-15 seconds. Strain into a chilled wine glass and top with ice cold Proseco or Cava. Sip happy and dream of love.